Jerold Ottley was the music director of the Mormon Tabernacle Choir, a post he held from 1974 to 1999. 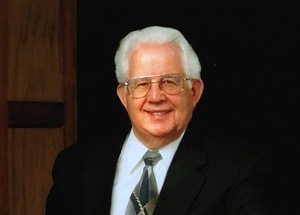 After his retirement, he taught voluntarily for four years as administrator and teacher for the Mormon Tabernacle Choir Training School at Temple Square and as a staff volunteer revising the choral library computer database. He then directed the University Chorale at Brigham Young University-Hawaii from 2005 to 2008. Ottley was born on April 7, 1934, and was musically gifted as a child. He became an accomplished pianist and in the fourth grade he began to play the trombone. His love for music was put on hold temporarily when he traveled with his parents to New Zealand, as they were called to serve a mission there. Ottley's education changed from excelling in music to no music program at the British boys’ school he attended. After high school he served a labor mission in New Zealand and was put in charge of entertainment. He directed a chorus that won the highest prize at the county fair. When Ottley returned to the United States, he studied trombone at Brigham Young University and earned his bachelor’s degree in music education. He went on to obtain his Master of Fine Arts degree from the University of Utah and a Doctor of Musical Arts degree from the University of Oregon. He was awarded a Fulbright fellowship with which he studied conducting, voice, and choral performance at the College of Music in Cologne, Germany. He taught and conducted music in Salt Lake City briefly then became a music instructor at the University of Utah, where he spent the next thirty years, eventually becoming associate chair of the university’s School of Music. He split his time between the university and the Tabernacle Choir. He retired from the university in 2002. A pattern of twenty years in the choir or turning age 60, whichever came first. Mandatory 75 percent attendance policy was put in place. He rearranged the seating every three months. Auditions became structured: recorded audition, theory exam, in-person audition. Ottley is a member of The Church of Jesus Christ of Latter-day Saints. He and his wife, soprano JoAnn, are the parents of two children. This page was last edited on 24 February 2016, at 14:45.